This book is Tony McNally's story... a British Army gunner in a Rapier battery, he witnessed war first-hand when his unit was sent to fight in the Falklands following the Argentine invasion of that British outpost in the South Atlantic. The Rapier surface-to-air missile system proved to be prone to failure, at least partially due to the rough handling it got on the way to the Falklands. Despite some spectacular failures of the system in "Bomb Alley" against a variety of Argentine aircraft it was later sent to support a landing further around the island... and McNally was forced to watch helplessly as the weapon refused to engage an Argentine attack aircraft which managed to bomb the transport Sir Galahad, killing dozens of British soldiers. 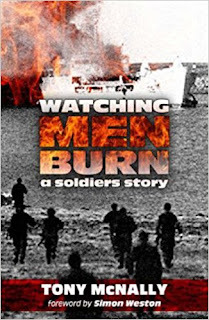 McNally's painful journey after that event, which took him in and out of the Army and from job to job, shows the pain and anguish of victims of PTSD; his writing is colorful, ugly, even vulgar at times but honest about his experiences. Well-illustrated with photographs.